My initial review of the original Baofeng UV-5R has been a while ago. Two problems (lowest possible volume and being off-frequency on RX) were fixed starting firmware versions 2.51 and up. After that nothing much changed — except for how the radio looked like. To be honest, all subsequent incarnations of the UV-5R were as exciting to talk about as the latest episode of My Little Pony. 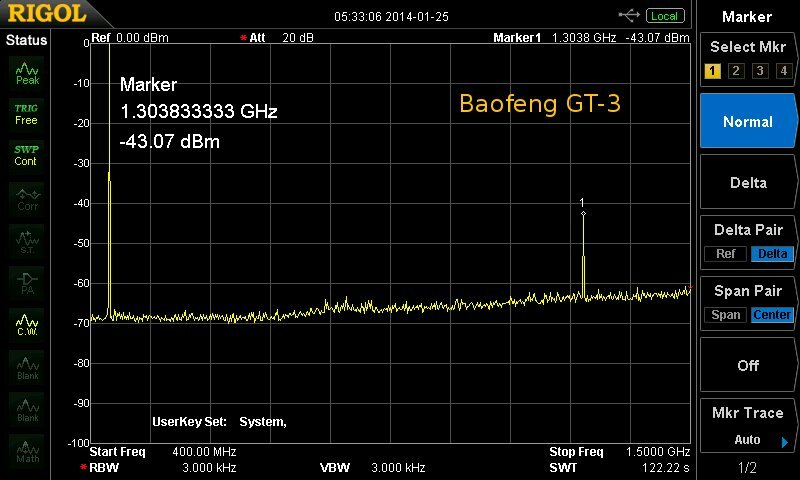 Then the Baofeng GT-3 appeared. I sighed, shrugged, scratched my behind and posted something about it, but I didn’t believe much of the Baofeng sales pitch. “This is The One!” for example is a bold statement, it sounded like Morpheus expressing his faith in Neo. In the end Neo proved to be The One, but hey, The Matrix was science fiction. The GT-3 is for real. Yet there were some indications that I needed to take this radio more serious. Early buyers reported that TX audio was much better, sensitivity improved, and squelch levels finally meant something. I arranged a review sample to compare the GT-3 to the UV-5R’s I own. I said that nothing much changed in the UV-5R world, but I forgot to mention one thing: TX audio quality. Later UV-5R versions didn’t sound as good as the early versions, TX audio became muffled and lacked sufficient punch. The problem annoyed a few hams to such an extent that they came up with all kinds of modifications, like using the VOX circuit to give the microphone signal a bit of a boost. The Baofeng UV-B5/B6 did away with all these issues: this model delivers bright, clear and loud audio. A decent front-end, capable of coping with most unwanted out-of-band signals, was the cherry on the cake. The Baofeng UV-82, a radio build around UV-5R circuitry and firmware, brought back quality TX audio too. One Watt of extra output power on both bands was a bonus. Even if the GT-3 would sound as good as the UV-B5 or UV-82, we’ve gained nothing. Let’s face it: TX audio was good. It got worse. If Baofeng fixed it we’re back where we started, nothing more. The Baofeng GT-3 looks good, but it’s always a matter of taste. The battery came fully charged out of the box. A quick tour through the menus showed that nothing much changed here either. While the shape of the the original UV-5R looks a bit like a kindergarten Lego project, the GT-3’s shape is more refined and much more comfortable to hold. After a full reset and setting all parameters to my liking, I took the GT-3 for a spin while walking the dogs. I couldn’t notice much of a difference. I realized that I really had to take both radios with me, and fit both with exactly the same antenna. I selected the (much better) UV-B5 stock antenna and did the test once again. I still couldn’t notice any difference between the two radios. We’re back where we once started: TX audio is fine again. No need for mods. The fancy inverse LCD is something to get used to. Like other owners reported already, this LCD may be fashionable but doesn’t offer the best readability. If the backlight goes out, it’s hard to make out the working frequency. The LCD is still prone to overheating, but to a lesser extent. Instead of a blackout you now will experience a whiteout. The stock antenna is one to throw into the bin. Not only does it perform poorly, it also heats up quickly. When replaced by the Baofeng UV-B5 antenna the radio comes to life, especially on VHF. Power output is exactly on target: 4/1 Watts on VHF, 3/1 Watts on UHF. The frequency accuracy is nothing short of amazing: +3Hz on both bands. Three Hertz! That’s equal to absolutely perfect. Not much of a difference; the GT-3 is marginally more sensitive on UHF. The GT-3 does a better job on both bands. On the old UV-5R squelch levels meant absolutely nothing on VHF, while the GT-3 creates a difference of 7 dBm between level 1 and 9. It’s still a far cry from what I would like to see, but at least it is an improvement. On UHF the differences are smaller. Harmonic suppression is a mixed bag. On VHF it’s a bit disappointing with only -53 dBm for the second harmonics, and it gets worse when we look at the third (-47 dBm) and fourth (-35 dBm) harmonic. Even a fifth and sixth harmonic are visible! The old UV-5R did a much better job. On UHF the second harmonic is perfectly suppressed, at -43 dBm the third harmonic is disappointing once again. Apart from antennas and speaker microphones, no UV-5R accessory is compatible with the GT-3. This is something to think over before you buy one of these. Apart from spare batteries there aren’t any accessories available yet. In the menu the backlight time-out can now be set to 10 instead of 5 seconds. Unfortunately it doesn’t work; five seconds is the maximum. Pity, this display could really use that. The manual is an improvement over the UV-5R, but still very basic. Contrary to other reports you can charge the radio while the belt clip is attached. There’s about an inch of clearance between the belt clip and the charger. The Baofeng GT-3 could not really convince me. A few things got better (squelch levels), other things suffered (harmonic suppression). The poor stock antenna is unforgivable; at this price you’re entitled to get the best. The lack of accessories doesn’t help either. The price is stiff. You can have one UV-5R with a bag full of accessories, big batteries and what not for the price of one GT-3, and you probably will still keep some money in your pocket. 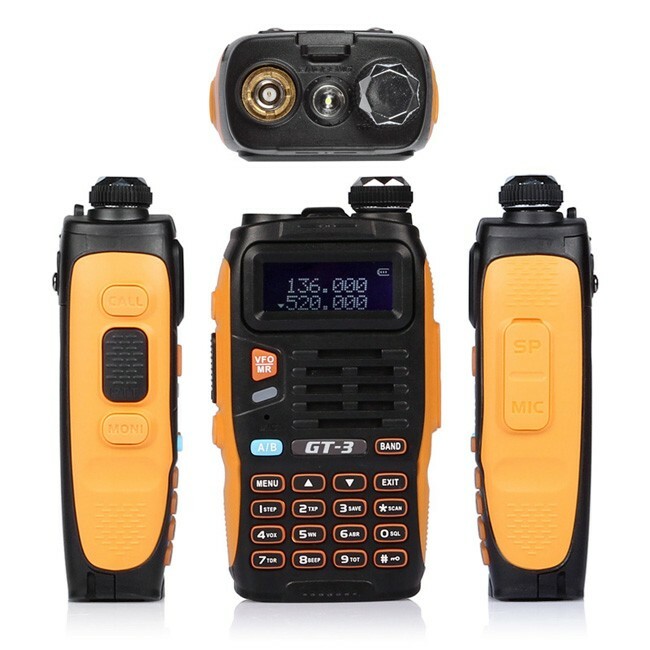 All in all I have difficulties recommending this radio at the current price — there are better performing radios out there which cost about the same, like the Quansheng TG-UV2. That said, I really like the fresh look. Mijn verlichting gaat na 26 sec max vanzelf weer uit. Owja, en laden met de riemclip erop is heel lastig want je moet een open buigen en voorzichtig over de rand van de lader zetten en niet meer aanraken ander schiet de porto uit de lader. Geen probleem bij mijn exemplaar. Misschien heb ik een andere lader? I won’t be getting one of those to the collection, thanks for the report Hans. And yet, five watts is the advertised RF output on both bands. What you measured is “on target” in the sense that it fails to live up to the false claims in roughly the same degree as other Chinese radios have for years now. Yep – tested the GT-3 myself. Nothing to get excited about. Radio gets warm at base of rubber duck, poor fit into charger, no direct support in CHIRP, etc. The UV-82 is a FAR better choice. Check out my Website for more Baofeng UV-82 details. I would like any info you have on the UV-82. Trying to pick my first radio. You’re in luck, I just posted my opinion because this question is asked over and over. FWIW: The UV-82 and UV82X (VHF/220MHz) are my Go To handhelds of choice. Did they fix the DTMF bug that some UV-5R versions have where a DTMF 0 is transmitted instead of D when you press the [EXIT] key? In my GT-3s, backlight CAN BE SET to 10 secs! More comments, after a few days of use! I have found that all SMA threads are created equal. It shows the thread differences/requirements of some antennas/radios. I have 2 BF-888S handhelds that both require extended thread antennas. I trimmed the base of Nagoya NA-771 as you did to assuse a good contact. It appears the GT-3 may require the extended thread also. I have found that all SMA threads are NOT created equal. “Contrary to other reports you can charge the radio while the belt clip is attached. There’s about an inch of clearance between the belt clip and the charger.” Really ??? I just got my new GT-3 and screwed on the belt clip and the bottom of the clip rubs against the rear of the charger base (as others have complained about) so I don’t get this ‘inch of clearance’ stuff. The UV-82 DOES have an inch of clearance but not the GT-3. Either I have got different chargers with a lower profile, or I have shorter belt clips. Either way, the radios that were delivered to me don’t have this problem. I suspect that there’s some variety in components between series. UV-82 is the clear winner…due to the larger taller size, Zero key placement, longer rubber duck, multi-coloured display and backlight to number contrast, and physically mounts better in the charger. End of story. 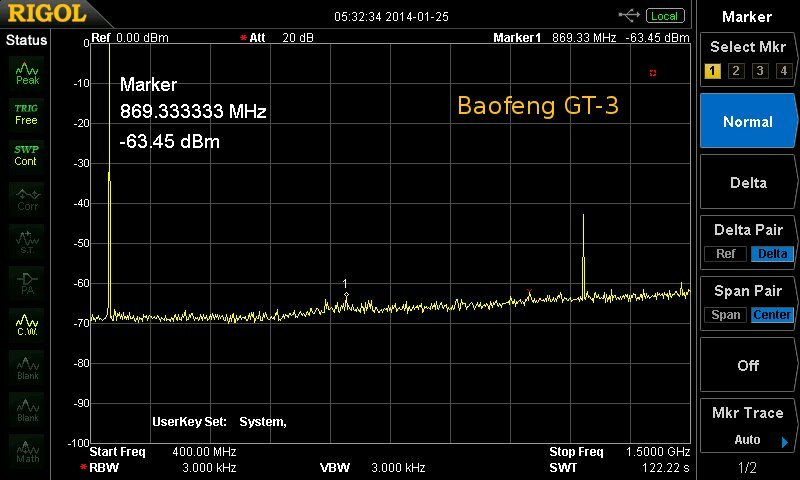 I completely agree with 3qdx and Gary ke2yk: the UV-82 is the Baofeng winner, with a slight edge over the GT-3. I have to admit that the GT-3 is its closest contender, as far as features, feel, ease-of-use, sensitivity, selectivity, drift, audio volume, third-harmonic filtering, and being on-frequency. But the GT-3 display takes a bit of getting used to, and it’s still over-priced. The one thing I will give to the GT-3 over the UV-82 is that it seems a bit more rugged because of its less rigid casing. To compare the UV-82 or GT-3 with the UV-5R or even the UV-B5 or UV-B6 is apples-to-oranges, IMO. 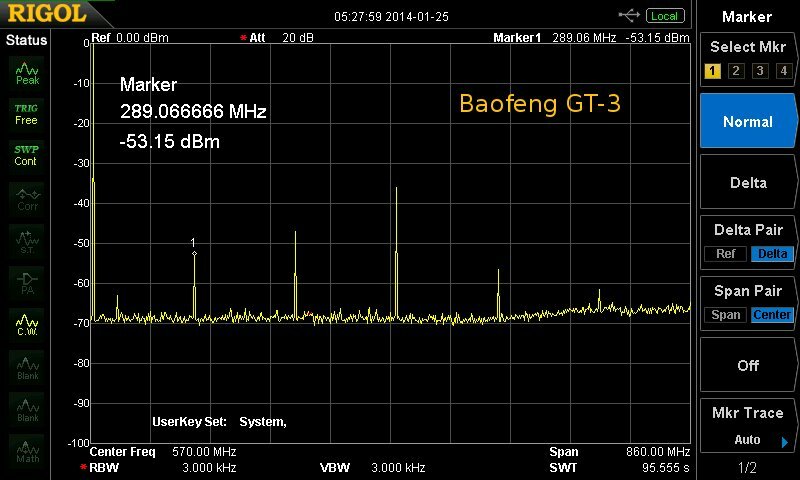 The UV-82 blows them all out of the water, and I predict that the UV-82 and / or GT-3 will force Baofeng to retire the other three because of that. HI There, Can you please confirm that your RF Power figures you state are true, regardless of the fact that the unit is advertised as 5W? I have the Mark2, but I’m a little confused. I need to know the power output so I can do ERP calculations according to a license I have. Power was checked on a recently calibrated Telewave 44A.